Ever since the roman times, hot water bathing has been a big tradition in cultures across the world. However, despite it all, many people don’t realize that today’s hot tubs offer many benefits. That’s right, besides luxury, there are many benefits of having a hot tub in your own back yard. Interesting in knowing those benefits so that you can have a good “excuse” to have a hot tub installed. For many of us, as much as we’d like, stress is something we cannot avoid. Every day, it seems as if we are more stressed than yesterday. If you’re looking for a good way to stimulate the body’s natural endorphin release, then you’ve found it! By soaking in a hot tub, your body will start to naturally release those endorphins. When you sit in the hot tub, the heat will increase the blood flow, while the therapeutic massage will work out the soreness of your muscles. In our overworked culture, stress is a silent killer – it results in headaches, muscle tension, fatigue and soreness, which overtime could lead to serious problems with your health. Not only will the spa’s buoyancy heal ease the pressure on your muscles and joints, the natural relaxation and mood elevation response is a great way to improve health. Looking at research coming from the National Institute of Health, there are over 70 million Americans that are suffering from mild to chronic insomnia, along with a variety of other sleep disorders. When you go out back and soak in a nice 102 degree water about 3 hours before bedtime, you’ll be relaxed. This method re-sets the body’s thermostat, making it easier for fall asleep and stay asleep all night. If you’re suffering from lower back pain, hot tub therapy might be exactly what you need. While the powerful jets of water shooting on your back will give you the massage you’ve been longing for, the heat will help sooth those sore muscles. Along with this, it will also promote spine flexibility in order to help with the stiffness of the spin, which is normally identified as a cause of pain in the lower back. Around 42 million people in the United States are suffering from some form of arthritis pain. Many of them turn to pain medicine for relief, but there are more safe and effective ways to help with the discomfort. By soaking in a hot tub, you can find relief from arthritis pain. By regularly going into the hot tub, it will help restore and preserve flexibility and strength – it also protects the joints from any further damage. The buoyancy of the hot water will lessen the stress on the joints and encourage free movement. If you have a family, they are the most important thing in the world to you. Yet, in this world, everything seems to pull us in a different direction, apart from our family. Activities, life, work, and even technology makes it hard to find quality time with family. Well, if you have an enjoyable hot tub in your back yard, this is something that everyone in the family will love and it could bring everyone back together, even if it is for just one night out of the week. Kids of all ages can have fun in the hot tub and it’s also a great place for teenagers to hang out with their friends. In the hot tub, parents will have the opportunity to enjoy real conversations that occur while they’re relaxing in the hot tub. Plus, with amazing jets, the entire family will get the chance to enjoy their own favorite massage or favorite water feature. If you want to be one of the most popular people in the neighborhood, then getting a backyard hot tub would definitely do the trick. With a new hot tub, you’ll be surprised to find that your house will instantly transform into a hot spot for your friends and family. A spa will create the perfect opportunity for socializing – you might even make some new friends. Large hot tubs with open seating layouts are ideal, because they give plenty of space and personalized massages for every person that is in it. Think about it – if your friends had a hot tub, wouldn’t you want to go over to their house? Usually when someone has a hot tub in their backyard, it becomes a popular hotpot for barbeques, get-togethers and the whole nine yards. A backyard hot tub can also help you rekindle your relationship as you can reconnect by unwinding in your own backyard. 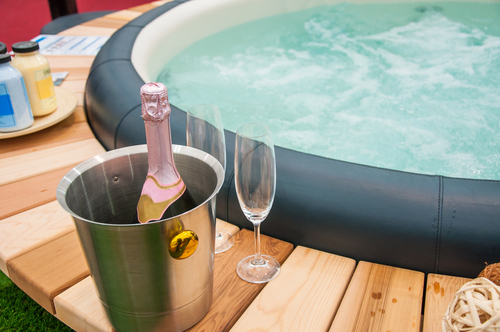 Owning your own hot tub is one of the best ways to create quality time that the two of you will appreciate. Just imagine the feel of swirling waters, fresh outdoor air, soft music, romantic mood lighting, all mixed in with some good old-fashioned aroma therapy. This is a great way for the two of you to step outside of those everyday distractions and open up a good line of true communication and strengthen your relationship. As you see, there are many benefits (mental and physical) of having your own backyard hot tub. Regardless of who you are, a hot tub is a great form of therapy that everyone can take advantage of.